I’ve found no stock trading book as fun to read as this one. Cramer’s first Mad Money book is the only one I’d rate as even partially enjoyable. This one happens to be 100% enjoyable. It’s a novel, a memoir, incidentally a manual, and a bit of philosophy all rolled into one. The narrator is Livingston, a boyhood wonder with a keen memory for figures and an intuitive eye for fluctuations. His career tale is about boom and bust, reputation and ostracism, the constant ups and downs, the cycle of repeats and his need to secure and then raise the stakes. 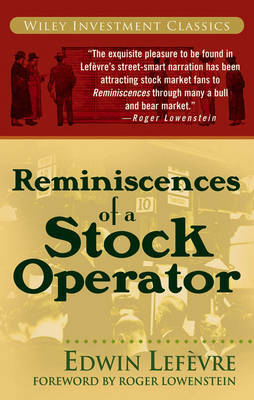 The author LeFevre presents the stock operator’s account in a conversational 1st person voice that is likeable and durable. It’s a fine novel with an interesting story, even without the aspects of being a lesson book in Market wisdom and attitude. It demonstrates by action as much as it tells. Livingston believes there is nothing the stock market hasn’t already experienced. It’s up to a trader/investor to read the signs and take some risks in order to be a profitable player. The reader will need to be willing to extrapolate in time and find the underlying market dynamics and psychology of traders as applied to Now. This story can make you want to lay out a stake, open a wildcat portfolio, and play the ticker with a Zen sort of knowing recklessness. Posted in booknotes and tagged Edwin LeFevre, stock books on November 28, 2014 by Wm P.